You can add big color to the garden on a small budget when you plant ranunculus. Most of the roughly 600 species in the genus Ranunculus, including buttercups, are herbaceous perennials that yield white or bright yellow flowers. They grow in U.S. Department of Agriculture plant hardiness zones 8 through 11. 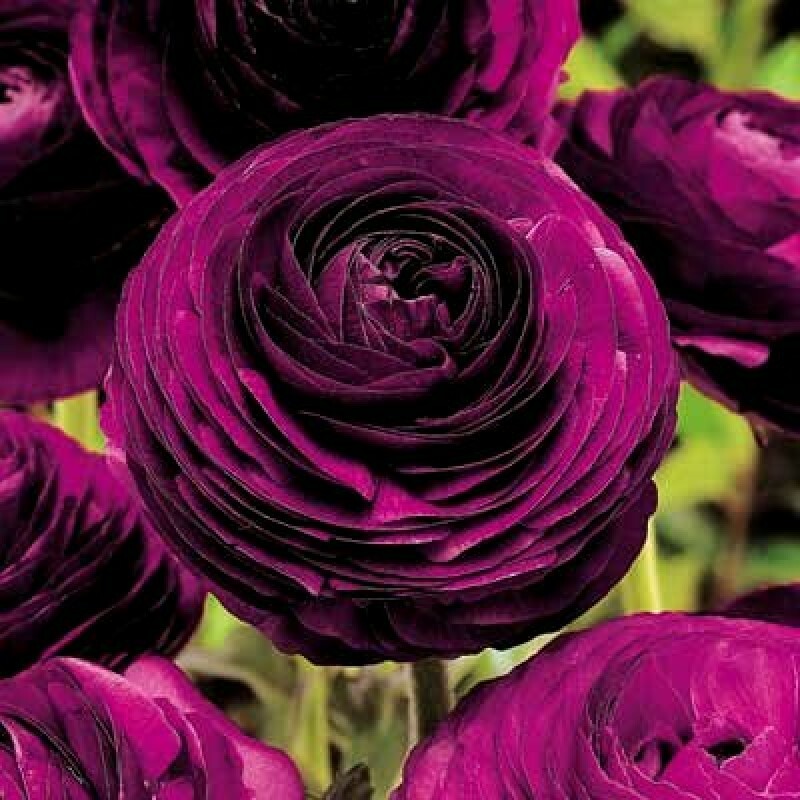 Although you can grow them from seed, ranunculus are typically grown from tubers that look like bunches of tiny, dark bananas, available inexpensively by the bag from nurseries and home improvement stores. Gardeners in mild climates can plant tubers in October or November to flower in March, while those in cooler planting zones should plant in the early spring for summer bloom. Nurseries typically sell ranunculus tubers in four sizes or grades. "Jumbo" tubers are from 2 3/4 to 3 1/8 inches in circumference. "Number One" tubers are 2 1/4 to 2 3/4 inches in circumference. "Number Two" tubers are 2 to 2 1/4 inches in circumference. "Number Three" tubers, rarely found on the market, are 1 1/8 to 2 1/4 in circumference. The National Gardening Association recommends planting Jumbo tubers because they yield about 35 flowers. A plant grown from a Number Two tuber yields about 20 flowers. A Number Three tuber yields about 12 flowers. Ranunculus bulbs grow best if they have six to eight weeks of weather that is 35 to 50 degrees Fahrenheit at night and 60 to 75 F during the day. If you plant them in the late spring or early summer with temperatures above 80 F, they go dormant and not sprout. Although the tubers may be dry and hard when you buy them, they soften and plump up after you plant them. It is not necessary to soak them in water before planting. Most gardeners treat ranunculus as annuals, pulling the plants up after they bloom. The tubers can rot in moist summer soils. After the blooms fade and the plants dry out, lift the tubers, cut off the tops, and store them in a brown paper bag in a cool dry place; they remain viable for a year. Warm dry air can dry them out. Moist, humid air causes them to mold. Plant ranunculus tubers 2 inches deep and 4 to 6 inches apart in an outdoor bed. The tubers rot if they sit in saturated soil. If water puddles at the site five or six hours after a hard rain, add organic matter to the soil to raise the planting level 2 to 3 inches above the ground or plant them somewhere else. Water thoroughly after you plant tubers and apply a mulch of straw, bark or coco hulls. If the soil retains some moisture, do not water until you see spouts. This is usually from 15 to 20 days. Plant one or two jumbo tubers or three Number Three tubers in a 10-inch pot. Choose a pot or tub that has a drainage hole on the bottom. Fill the container with a potting soil. Plant the tubers 2 inches deep and 4 to 6 inches apart. Water the container well to settle soil and put it in full sun. Sow seeds thickly indoors in a peat-based starting mix in late winter. Maintain a soil temperature of 50 F. The seeds should germinate in 20 to 30 days. After the seeds germinate, maintain the seedlings at 55 F until you plant them outdoors in the early spring.